*Please note: The Vw Touareg (<2008) require CANBUS Adaptor, This is included in the price below. Unfortunately models that require CAN adaptor will not display Sat Nav info in the Driver Information System. This applies to all Touareg's before 2008. Models with CAN adaptor cannot be changed to Mph in map mode. Only limited functions of the MFSW will operate such as volume control. You will have the radio station name displayed in the DIS. Note: optional reverse camera is only available with guide lines and auto switch on the Touareg 2008-2010. All other models can be fitted with a rear view camera but will require manual selection on the RNS-510 by uising the Media button, this can be used in reverse and when driving normally. (no auto switch when in reverse). 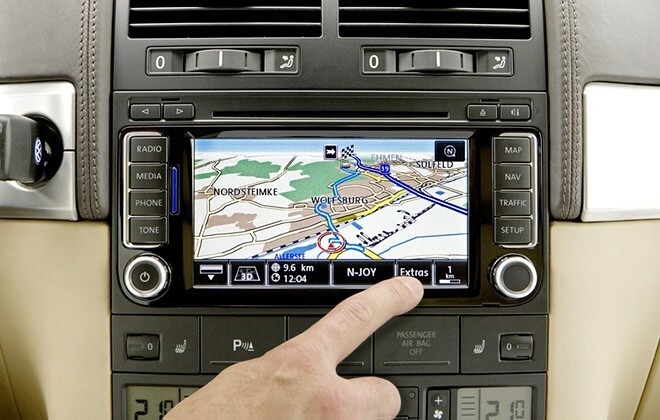 Installation usually takes 1-4 hours for RNS-510 Sat Nav install depending on the model. Optional extras such as Bluetooth, MDI or camera will take longer to install. Above: RNS-510 fitted to Vw Touareg (2003-2010).